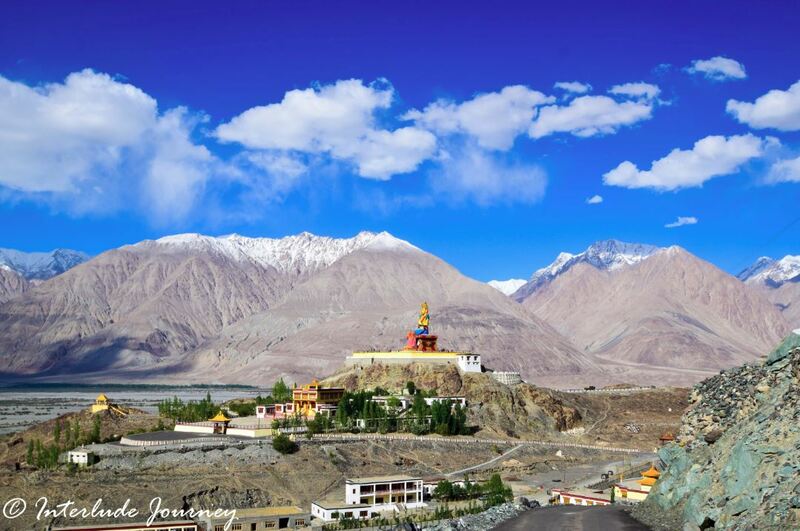 About 140 km north of Leh, far beyond the formidable Kardung La pass is the high altitude cold desert called Nubra. As one crosses the K-Top or kardungLa and descends down the rugged rock-strewn mountains, the geography dramatically changes into a wonderland consisting of lush green fields, poplar groves, orchards of fruits and nuts and tiny hamlets along the rivers that meander in the valleys cradled between the jagged mountains. 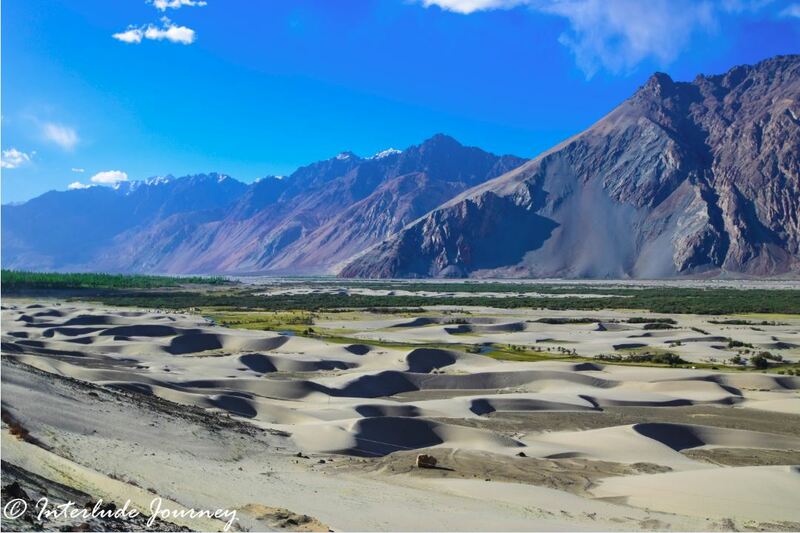 The Nubra valley actually encompasses two valleys formed by rivers Shyok and Nubra, both of which originate from the glaciers in the troughs and peaks of the mighty Karakoram range. 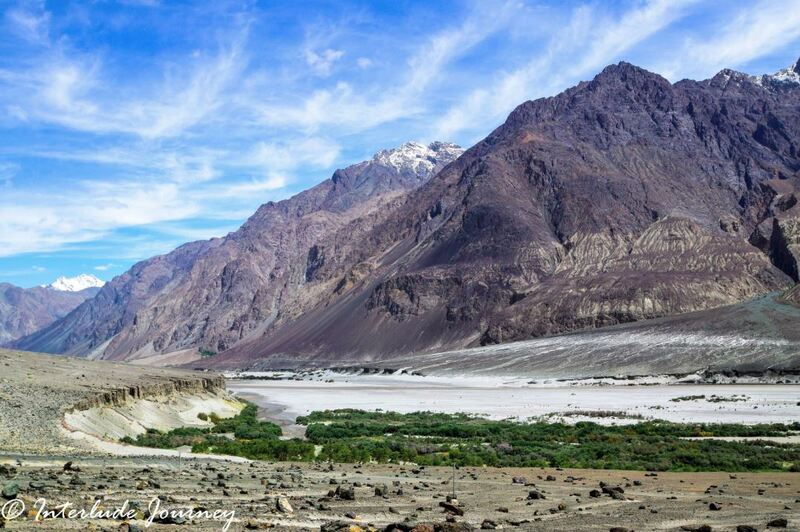 The Nubra river flows along the towns of Panamik, Sumur, and Kyagar to merge into the Shayok river which further flows along the towns of Diskit, Hunder, Turtuk and enters Pakistan to join the Indus river. 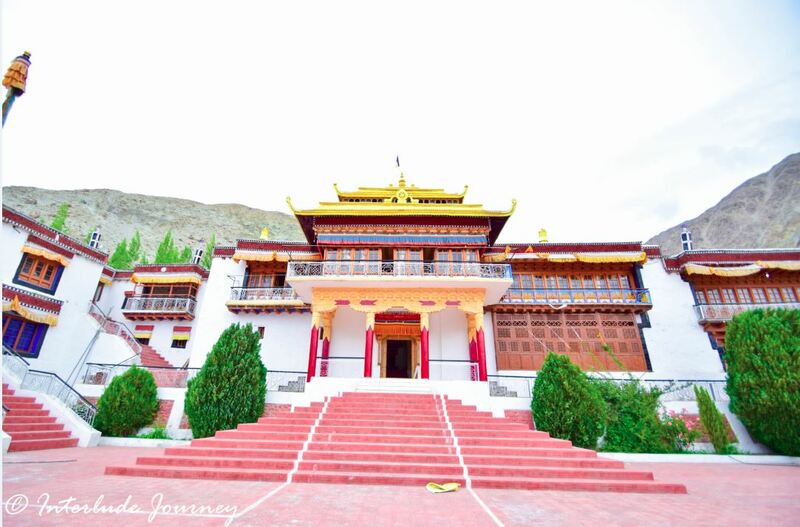 Diskit is a major commercial hub in Nubra valley and is also home to the popular Diskit Monastery perched on a craggy peak above the town. A huge ornate status of Maitreya Buddha overlooking the Shayok valley is a major attraction in Diskit. The whitewashed chortens( Buddhist stupas) built on the slopes of the hills standout against the brown of the stark hills in the region. About 10 km west of Diskit is a picturesque hamlet named Hunder which sits like a tiny oasis in the middle of the cold desert of Nubra. Hunder is famous for its double-humped Bactrian camels. Shrubs of seabuckthorn grow in abundance in the sand dunes along the Shayok river near Hunder. One feature which is very typical of the Nubra is the abundance of pink roses which grow wild in the valley.There is a very interesting legend associated with the roses in the Nubra valley. Once upon a time, a small Yarkandi village stood guarding the entrance to a mighty glacier of the Karakoram range. It was a meeting place for Balti traders to barter their goods with Central Asian merchants. One day, the Yarkandis decided to visit their southern neighbors; they descended from the glacier, but before returning north, they could not resist taking away a beautiful Balti girl. The offense could not remain unpunished.The Baltis contacted a local cleric, who gave them an amulet to be placed on the summit of the Bilafond pass on the Saltoro ridge. The villagers were told to strictly follow the priest’s instructions and come back via Nubra valley. However, the Baltis performed only the first part of the ritual. After leaving the amulet on the pass, they did not use the Nubra track to return. 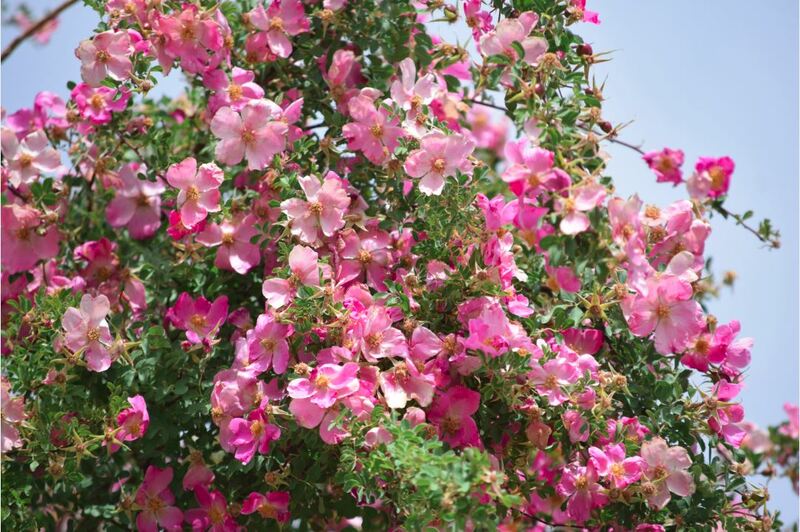 Legend says that a terrible storm destroyed the Yarkandi village and only a few stones and wild roses remained.The legend further says that the wild roses survived the storm because the priest’s instructions were partially followed. And the glacier came to be known as Siachen- Sia meaning rose and chen meaning place- ‘The place where roses bloom’. Going further north from Hunder, one reaches Turtuk, the last Balti village on the northernmost frontier of India which remained inaccessible for visitors till the year 2010. 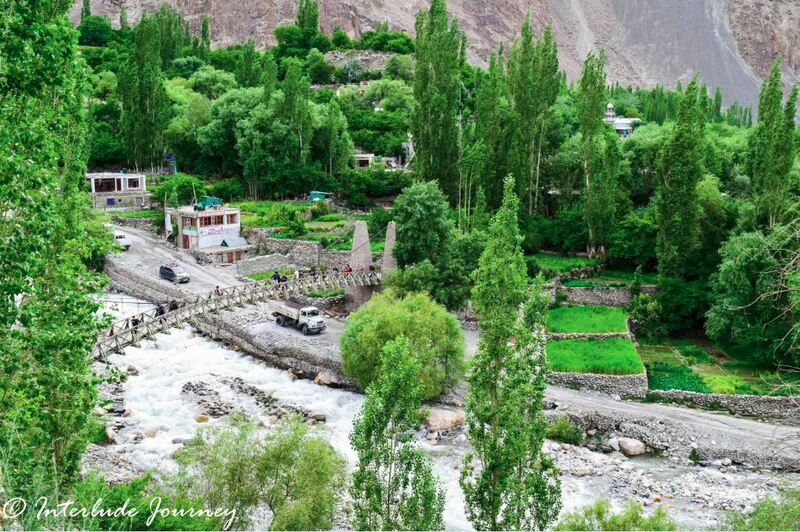 Turtuk which is just 10km away from Indo-Pak border is greener than the Nubra valley owing to its lower altitude. The melange of barley and mustard fields, apricot and walnut trees, the gurgling stream dividing the village into two regions- Farol and Youl which are connected by a wooden bridge- all seems like poetry to eyes. Sumur is another important commercial hub in Shyok valley- like Diskit in the Nubra valley. The Samsthalink Monastery is a major tourist attraction in the locality. Another tourist attraction in the region are the hot springs of Panamik. The road further leads to Siachen glacier- the worlds highest battlefield. The impregnable boundaries of Ladakh which comprise of huge mountains, yawning valleys, and vast uninhabited hinterlands surprisingly had amidst them many trans-Himalayan trade routes which originated with the silk route during the ancient times. For centuries, caravans of wool and cloth, opium, spices and skins, coral and turquoise, gold and indigo negotiated the ridges and the hazardous passes to carry out the trade between Leh and Yarkand (currently in China) till China sealed its boundaries in the late 1950s. 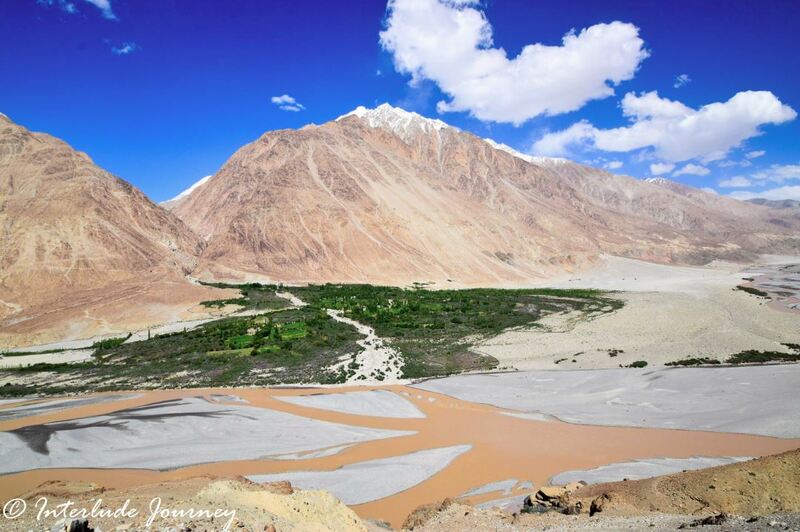 Reaching Nubra valley – Nubra valley is located at a distance of 140 KM from Leh in Ladakh. 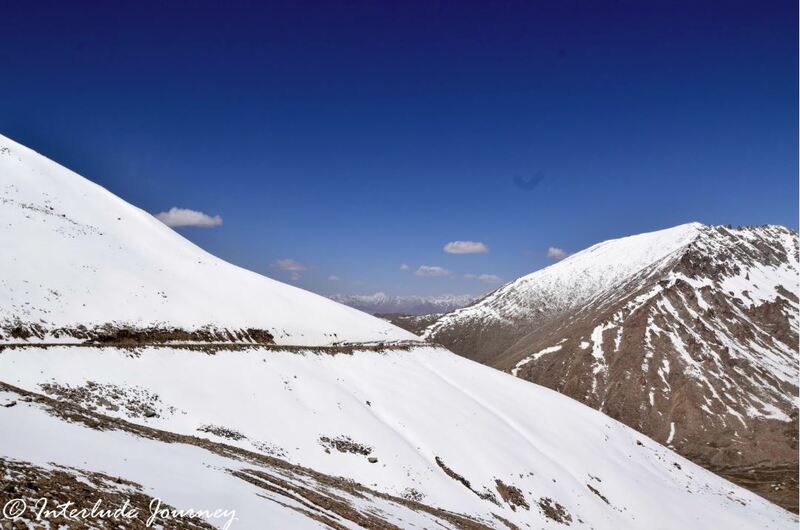 Diskit, Hunder, Sumur and Turtuk are connected by road via Kardungla pass and buses ply infrequently to these places from Leh. It is better to hire a car or jeep rather than depending on public transportation. Accommodation: Guesthouses, homestays and tented accommodation are available at Hunder, Diskit, and Turtuk. The cost varies depending on the season and availability. Permit: Inner line permit is needed for everyone irrespective of nationality to visit various places in Nubra valley. Check this site for the latest details on permit requirements and procedure to obtain it.